What has a plumb bow and two sets of caterpillar treads? The category-breaking Iguana Commuter Sport Exclusive. 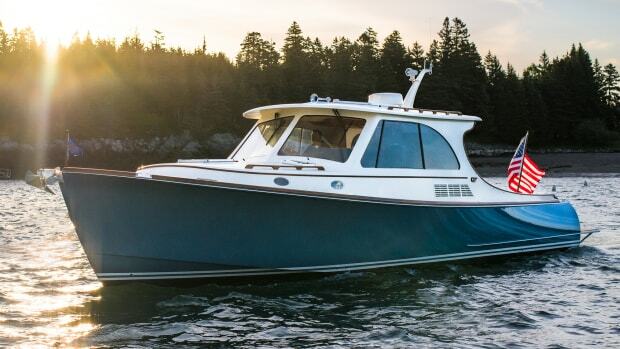 Just when you thought surf and turf was a restaurant-only thing, along comes a stylish, top-shelf speedboat with a set of rubber, terra-firma-travelin’ tracks. 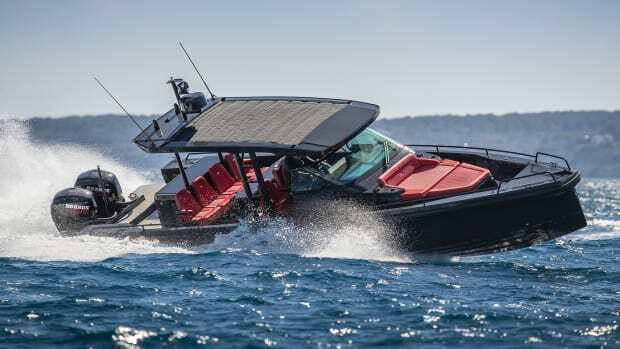 I’ve sea trialed thousands of boats over my ever-lovin’, 31-year, marine-mag career, but this baby—arguably the most unusual, interest-generating entry at last year’s Cannes boat show—had to be an absolute first. Indeed, as Editor-in-Chief Dan Harding and I strolled down the steeply sloping beach just off the show’s entrance we were constrained to stop for a moment and just stare. I mean, the sleek, plumb-bowed, post-modernistically styled, metallic-grey Iguana Commuter Sport Exclusive constituted a sort of vision out there on the sand, fairly glistening in the French Riviera’s sunshine, sturdily supported upon two sets of caterpillar-type tracks. “Nope—neither have I, Capt. 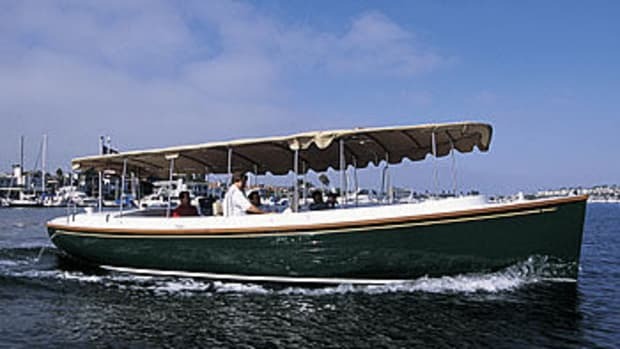 Bill,” he replied as we resumed walking, ultimately drawing close enough to carefully examine the Commuter’s two, metallic-grey, color-matched, 200-hp Mercury V6 3.4L four-stroke outboards, her angular Euro-transom and her rakish, tempered-glass windshield (topped off with what appeared to be an up-and-down adjustable hardtop). Assorted clumps of wet sand clung to her rubber tracks, a surefire indicator of sea trials in the offing, ours included. Steve Huppert of Iguana Yachts International met us on the beach. 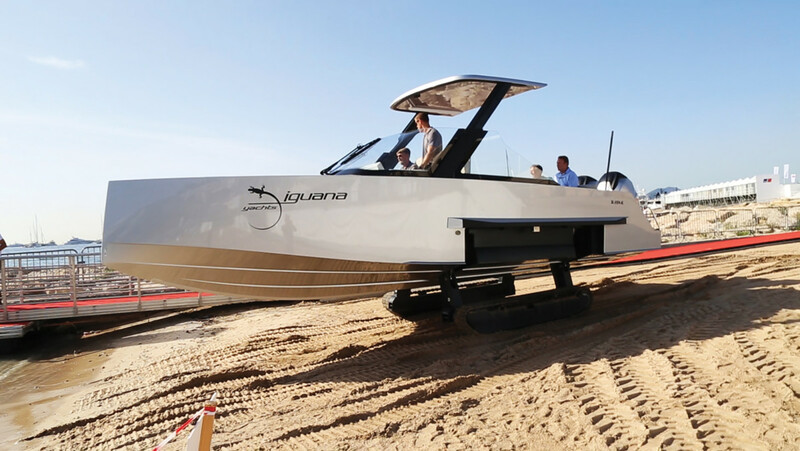 In short order, he explained that the Commuter—one of several models from Iguana (including a nifty yacht tender)—was designed by Normandy-based inventor Antoine Brugidou to be a relatively fast, dry, stable, super-handling carbon-fiber speedboat. But in addition, Brugidou had given the craft an electric-motor-energized “Ground Mobility Drive” (GMD) that facilitates coming ashore, caterpillar-style, and then moving about, forward, backwards, left or right, over fairly rough terrain at speeds in the 4- to 5-mph range. The GMD’s basic technology was impressive. 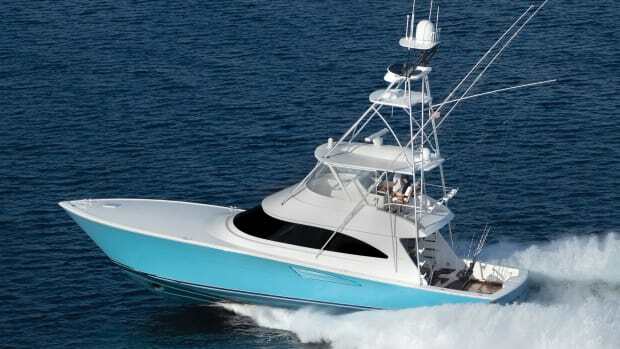 The tracks deploy hydraulically and, because of the considerable draft they ultimately produce, safely take the ground well before the skegs of the outboards. 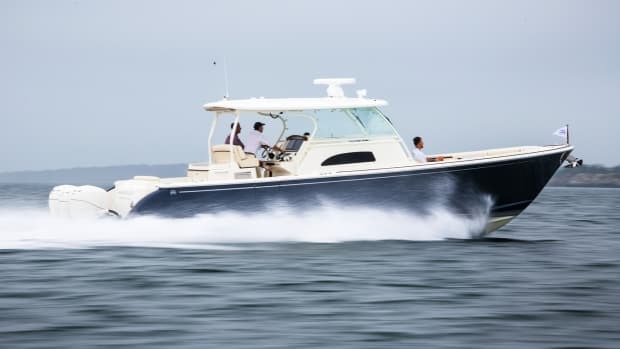 In seagoing mode, the tracks retract into molded depressions in the hullsides, above the chine line, so they create no performance diminishing drag or handling issues, even in sharp turns. 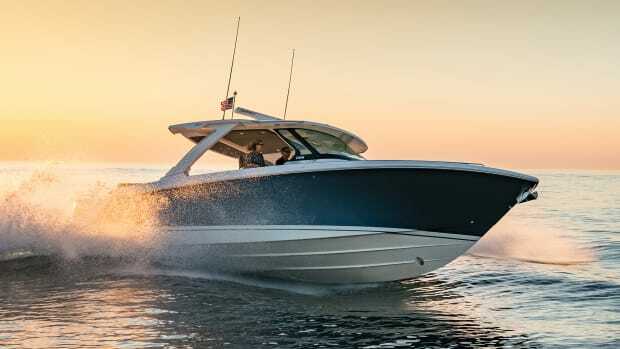 Moreover, when retracted, they keep the boat’s vertical center of gravity low, a feature that both tightens and flattens cornering at speed. Dan and I were equally impressed with the finer points of the GMD’s engineering. 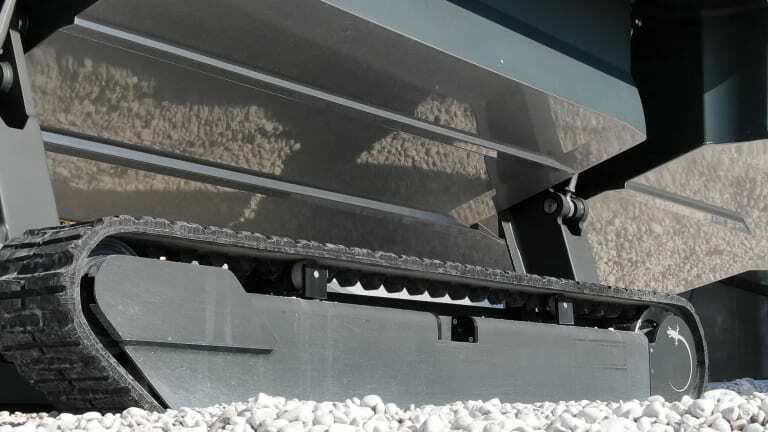 The drive wheels for the tracks, for example, can be dynamically tensioned to soften both ride and footprint—tighter for rocky surfaces and looser for sandy beaches. All of the components are made of galvanically isolated aluminum and high-grade stainless steel. And, according to Huppert, the system is capable of slowly but surely climbing a challenging 30-percent grade. 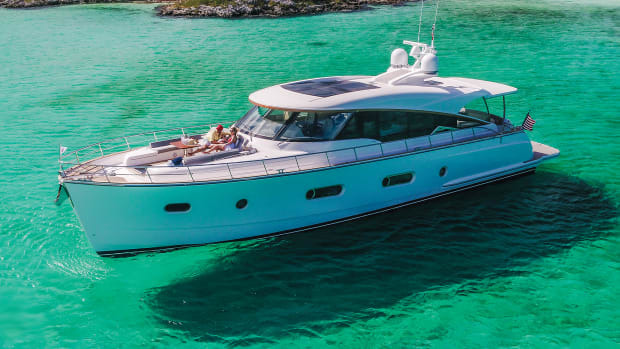 The Commuter occupies the high end of Iguana’s product line, by the way—she costs $693,000 with a single 350-hp Merc and $784,400 with twin 200-hp Mercs. So, in keeping with these lofty figures, I was not surprised when our perusal of the cockpit and interior turned up some truly fancy electrically adjustable, shock-absorbent helm seats (with automotive-style memory) and a swim platform ladder that went up and down with the push of a button. 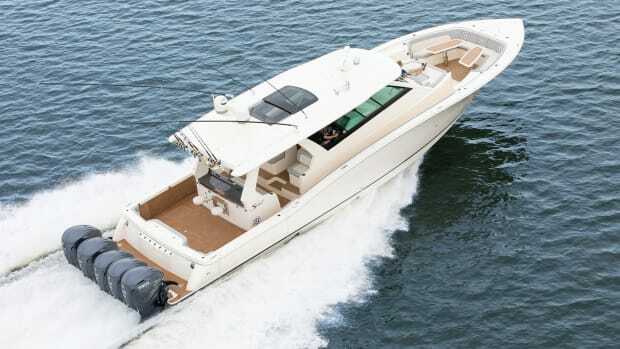 Other noteworthy features included top-stitched, leather-upholstered lounge seating abaft the helm, a cuddy forward with a V-berth and portable head and a self-cooling, energy-dense Kreisel lithium-ion battery pack belowdecks. 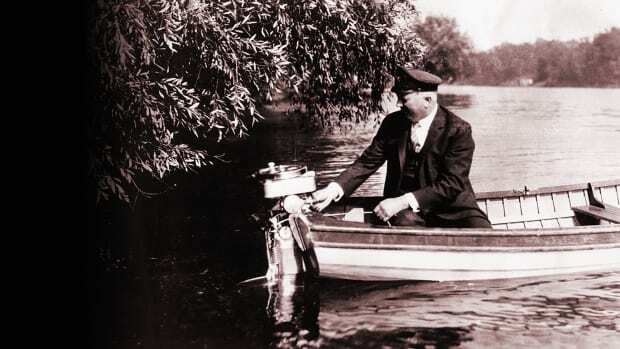 In order to sea trial our Commuter we had to manipulate the two, dashboard-mounted, side-by-side levers that actuate the GMD, an exercise best accomplished (if forward motion is desired) by laying the thumb across both levers and applying gentle pressure either right, left or straight ahead. For grins, Huppert encouraged me to simultaneously push one lever ahead and pull the other aft, thereby generating a sort of twin-screw rotation. Backing up entailed simply applying the forward-motion principles in reverse. All this sounds simple enough, I suppose. But I found it quite challenging, not least of all because I occasionally got a tad confused, attempting to exert control using the binnacle’s throttle and shift levers with my right hand (like we were already riding the waves) instead of the levers of the beach-cruising GMD with my left hand. “I’d need a little practice to get the hang of this,” I told Huppert as we meandered embarrassingly towards the water. 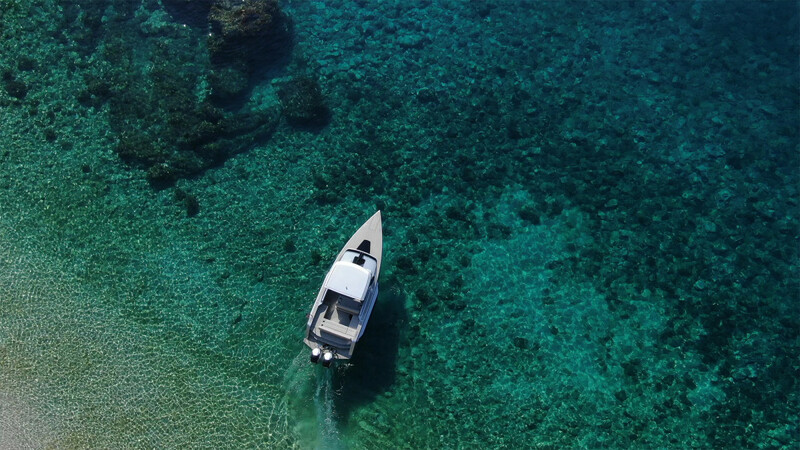 Once afloat, I was in my element, however. I simply lowered the Mercs until their pickups were submerged, cranked ‘em up and then continued seaward until we were obviously in deep water, at which time I retracted the tracks. 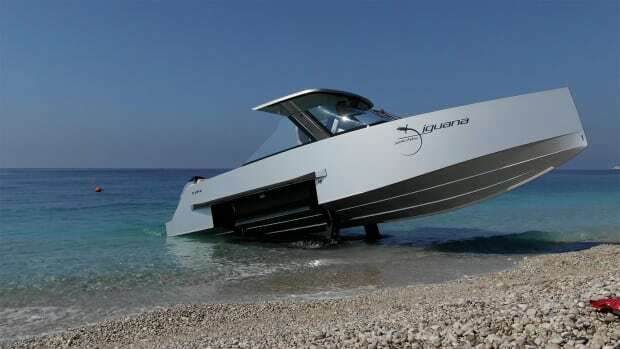 In spite of her landing-craft capabilities, she’s more speedboat than Jeep. And indeed we were. While I’d been counting on slow-pokey performance, what materialized was anything but. Arrow-straight, one-way speeds, as shown on our Garmin MFD, hovered in the 36-knot vicinity and cornering had a race boat feel, with no appreciable slide or blowout. Had I had some extra time to play with the drive trim, I might have gotten even more speed out of our rousing reptile atop the 2-to-3-footers of Cannes Bay. Dan drove back to the beach—and hey, the guy was a freakin’ natural! Once the Commuter’s tracks were deployed and touching bottom, he deftly cut the Mercs, raised them and beelined straight ashore at a top speed of 4.5 mph, thereby demonstrating an immediate grasp of proper terra-firma technique. “Well, thank you, I appreciate that,” he responded with a grin. “My mom used to say all those years of playing PlayStation would rot my brain—well, mom, who’s laughing now?